Spring Break 1994, Elsa and I went camping. This was our last spring break as students, since we were both completing our master’s degrees in education that year. I had already started working as a long-term substitute teacher in the school district where Elsa and I had met and become friends in the late ’80s. I had married the previous fall, so things were already becoming so very different, so very “adult.” We weren’t the girls we had been when we first became friends in Madame McCoy’s French class where I learned that elle s’appelle Elsa and that she had the most joyous laugh I’d ever heard. We were friends through all of our crushes on boys, through difficulties and illnesses in our families, through the transition from high school to college to adulthood. She taught me about quetzals, Chapinlandia and malas. In high school we rode around Duncanville listening to Morrissey. On one drive, we ran over a bottle. She was run over once too by a car in the school parking lot and limped for what seemed like months. We loved James Dean, kitty cats and movies with Edwardian ladies. In college, we lived together for three years: first in the quiet wing of the women’s dorm at UNT where we got in trouble for listening to violin music too late; then at our very first apartment with Jessica and Akhenaten the cat; then in the funkiest apartment ever over the Clock Shop (no longer there) in Denton, Texas. We student-taught in a frightening, urban middle-school together, where one of her students—probably drunk, probably high—shot himself in the head while playing Russian roulette at a party one night. We shared one bad professor and other great ones. In graduate school—in the months before I married—we were neighbors one last time at the Normal Street apartments where we lived near a pot-bellied pig named Saucy, a member of Brave Combo and a man who mooed like a cow. Over the years, we travelled together. In France we walked on stones by the Mediterranean Sea and had a crush on a boy who worked at a bookstore in Cannes. It was in St. Tropez where she started calling me by my all-time favorite nickname: Cindycat. On our way to my grandmother’s church convention in Texarkana, we ate way too many Oreos and Funyuns. 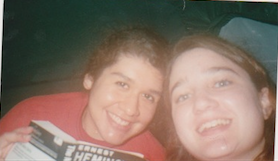 But on this particular day, camping at Pedernales Falls, after driving across Texas listening to Nirvana, we went to “bed” early to read stories we loved in a field near cows where we took this late-20th-century selfie.